Taipei, Oct. 17 (CNA) Taiwan remains 13th in the World Economic Forum's (WEF's) Global Competitiveness Report 2018, as well as fourth in East Asia and the Pacific. In the competitiveness rankings among countries in East Asia and the Pacific, Taiwan finished behind Singapore (2nd overall), Japan (5th) and Hong Kong (7th) but ahead of Australia (14th), South Korea (15th) and New Zealand (18th). Taiwan was also one of only four countries among the 17 economies in East Asia and the Pacific to remain in the same position as in last year's rankings, along with Singapore, Hong Kong and China (28th). In its Global Competitiveness Index 4.0 2018 rankings, the WEF assessed the competitiveness of 140 economies based on 98 indicators organized into 12 pillars. The pillars are: "Institutions," "Infrastructure," "ICT adoption," "Macroeconomic stability," "Health," "Skills," "Product market," "Labor market," "Financial system," "Market size," "Business dynamism" and "Innovation capability." Taiwan shared first place in the "Macroeconomic stability" pillar along with 31 other countries and 27th in "Health" with four others. 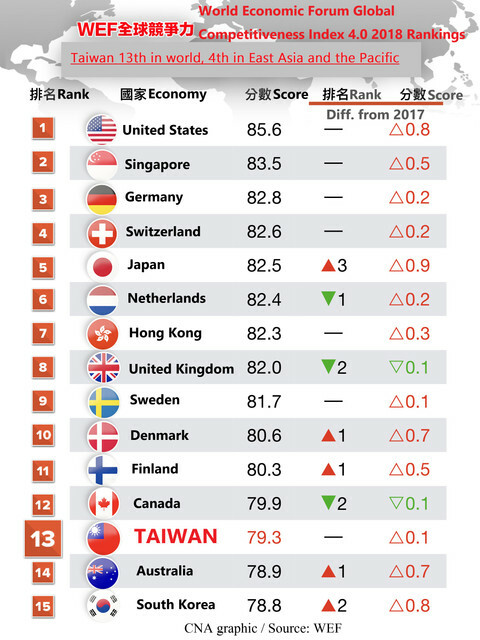 Taiwan made it into the top 10, ranking seventh and fourth for "Financial system" and "Innovation capability," where the top performers were the U.S. and Germany, respectively. Taiwan ranked 25th, 22nd and 13th in the "Institutions," "Infrastructure" and "ICT adoption" pillars, where the best performers were New Zealand, Singapore and South Korea, respectively. It ranked 21st, 18th, 16th, 20th and 21st in "Skills," "Product market," "Labour market," "Market size" and "Business dynamism," where the best performers were Finland, Singapore, the United States, China, and the U.S., respectively.